Above: The beautiful Kay Aldridge in a publicity portrait from her last serial, Haunted Harbor (Republic, 19440. Republic Pictures’ first official “Serial Queen” was Frances Gifford, while their third and last was Linda Stirling. But in between Gifford and Stirling, Kay Aldridge held the queenly throne at Republic, and while she was not as skilled an actress as either her successor or predecessor, she had a charm that made her perhaps the most endearing of all Republic’s heroines. Blessed with a lovely face and figure, Kay also could convey a wide-eyed enthusiasm and whole-hearted energy which contrasted strongly with the typically serious and low-key manner of most 1940s serial heroines; she was something of a throwback to the more emotional serial heroines of the 1930s and the silent era. Kay could register terror very vividly when facing her many on-screen perils, and she brought real warmth and sincerity to dialogue scenes. Her acting may have been unsubtle and slightly awkward at times, but even this awkwardness was endearing, and seemed well-suited to the charmingly guileless ingenues she played. Katherine “Kay” Aldridge was born in Tallahassee, Florida, and grew up in Virginia. She worked as a secretary in Baltimore after finishing high school, until one of her cousins sent her picture to the John Powers modeling agency in New York. To Kay’s surprise, the Powers agency quickly sought her services, hiring her as a model in 1936. Over the next few years, she became one of the most-photographed girls in America, appearing in numerous advertisements and on the covers of magazines such as Collier’s, Life, and Redbook. She made her screen debut in Vogues of 1938, a 1937 Warner Baxter drama set in the world of modeling, basically playing herself in the uncredited part of a model named Katherine. In 1939, Twentieth-Century Fox signed her to a contract, and for the next two years she appeared in a variety of Fox films, among them dramas like Here I Am A Stranger and Free, Blonde, and 21, B-mysteries like Girl in 313, the Gene Autry western Shooting High, and a Charlie Chan whodunit called Dead Men Tell. She was a perennial “second banana” in all these films, playing in support of other Fox stars and starlets. Her last Fox movie was the Jane Withers vehicle Golden Hoofs in 1941, after which she freelanced at other studios, appearing as a chorus member in the Warner Brothers comedies Navy Blues and You’re in the Army Now and the Bob Hope Paramount outing Louisiana Purchase. In 1942, she finally broke out of background roles, landing the lead in one of Republic Pictures’ serials. Perils of Nyoka, Aldridge’s first cliffhanger, had originally been intended as a vehicle for Frances Gifford, star of Republic’s Jungle Girl (1941). Gifford’s contract with Paramount precluded her starring in a second Republic serial, so the studio signed Kay to take up their “Serial Queen” mantle. She inherited the somewhat bizarre first name (Nyoka) of Gifford’s Jungle Girl character, but there was no other connection between Perils and the earlier serial. Gifford’s Nyoka Meredith had been the daughter of a murdered jungle physician, while Aldridge’s Nyoka Gordon was the daughter of a prominent scientist who disappeared in the North African desert while searching for the “Lost Tablets of Hippocrates.” Nyoka joined an expedition led by Dr. Larry Grayson (Clayton Moore) in order to locate her father, and eventually discovered him living as the amnesiac ruler of a lost Arab tribe. Nyoka’s quest was dogged every step of the way by desert ruler Vultura (Lorna Gray) and her henchman Cassib, who were after the treasure buried with the lost tablets, but with the help of the valiant Dr. Grayson, Nyoka survived every peril that Vultura threw her way, including a wind tunnel, a swinging pendulum blade, a fire pit, and attacks by Vultura’s pet gorilla Satan (Emil Van Horn). Perils of Nyoka, replete with action, location shooting, and exotic atmosphere, was one of Republic’s biggest hits, and it won Kay Aldridge a prominent place in the hearts of serial fans. She was athletic enough to carry off horseback chases and other action sequences convincingly, and she delivered her dialogue with complete, almost vehement conviction. Above: Kay Aldridge makes her first entrance in Perils of Nyoka (Republic, 1942). 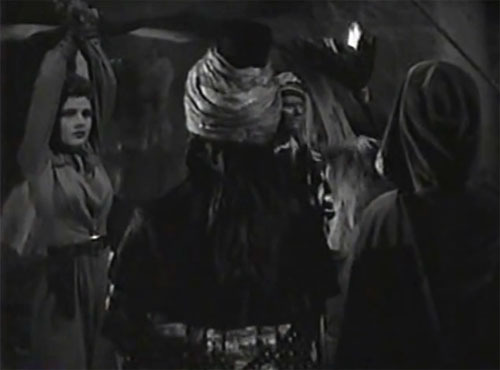 Above: Kay Aldridge is about to be suspended over a fire pit by her amnesiac father (Robert Strange, in the turban) and Lorna Gray (wearing the hooded cloak) in Perils of Nyoka. Kay played a few bit roles in feature films before Republic cast her in her next serial, Daredevils of the West (1943). She played June Foster, daughter of a murdered stage line owner, who was trying to complete her father’s work by building a stage route through the Cherokee Strip. Local businessman Martin Dexter (Robert Frazer) wanted the Cherokee Strip’s land for himself, and was determined to see that the Foster stage line didn’t open the area to settlers. Dexter instigated numerous Indian and outlaw attacks against June’s outfit, but with the help of cavalry officer Duke Cameron (Allan Lane) and line foreman Red Kelly (Eddie Acuff), June succeeded in overcoming Dexter’s machinations. Daredevils of the West was unusually action-packed, even for a Republic serial, and maintained a breathlessly exciting pace from start to finish. 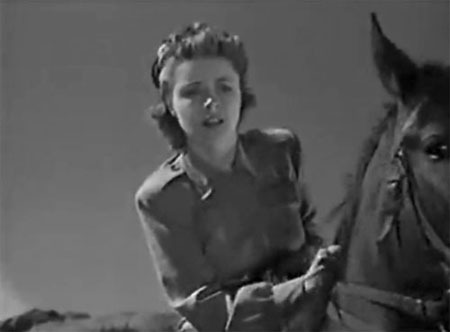 Kay, along with her co-stars, was given few respites from chases, battles, and explosions, but her appealing personality helped the audience to immediately sympathize with her and be concerned about her character throughout the serial’s lengthy parade of action. Above: Eddie Acuff (back to camera), Kay Aldridge, and Allan Lane in Daredevils of the West (Republic, 1943). Above: Eddie Acuff and Kay Aldridge prepare for the trial run of the Foster Stage Line in the climactic chapter of Daredevils of the West. Aldridge’s final serial was Haunted Harbor (Republic, 1944). This time she was paired with leading man Kane Richmond, who played Jim Marsden, a South Seas schooner captain wrongfully accused of murder. Richmond set sail for the “haunted” island of Pulamati in search of the real murderer, a mystery man named Carter. Along the way, Marsden rescued itinerant physician Dr. Harding (Forrest Taylor) and his daughter Patricia (Kay) from a shipwreck, and the grateful Hardings agreed to use their knowledge of the islands to aid Marsden’s search. Upon arrival on Pulamati, Dr. Harding recognized island mine owner Kane (Roy Barcroft) as Carter, but Kane had the doctor killed before the old man could pass the information on to Marsden. This gave Patricia her own motive for wanting Carter brought to justice, and she and Jim attempted to solve the various mysteries of Pulamati, despite interference from their supposed “friend” Kane and his band of thugs. Haunted Harbor was not as atmospheric as Perils of Nyoka or as action-packed as Daredevils of the West, but it still had more than enough action and atmosphere to go around. It also possessed an outstanding cast, including villains Barcroft, Kenne Duncan, and Bud Geary, hero Richmond, and, of course, our heroine Kay Aldridge. Whether screaming with convincing terror when trapped in a blazing truck or fervently promising Richmond that she’d help him track down the murderous Carter, Kay imparted the same sincerity to her character that she had brought to her two earlier roles. 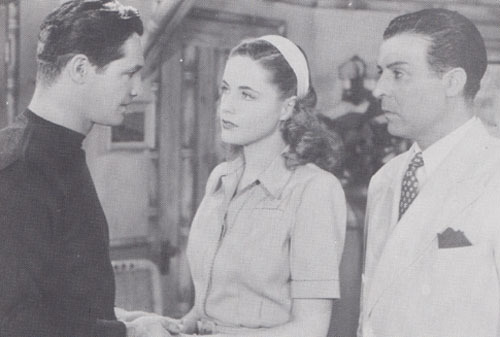 Above: Kay Aldridge convinces Kane Richmond (left) to let her help him track down the men responsible for her father’s death in Haunted Harbor (Republic, 1944). Secret villain George J. Lewis doesn’t appear too pleased with this. Above: Kay Aldridge and Kane Richmond are attacked by hostile natives in Haunted Harbor. Rico De Montez is on the far right. After Haunted Harbor, Kay played the leading lady in two more films–the romantic comedy The Man Who Walked Alone and the thriller The Phantom of 42nd Street, both released by the low-budget studio PRC in 1945–before marrying and retiring from the screen. She reentered the public eye in the 1970s, making multiple appearances at serial conventions; she enjoyed recounting her adventures during her serial-making days, and donned a facsimile of her old Nyoka outfit for one appearance. She died in 1995 in Rockport, Maine, where she had spent much of her later life. Kay Aldridge once described her acting talent as only “fair.” While most of her fans might agree–certainly few would try to claim her as an accomplished actress–they would undoubtedly point out that her lack of acting subtlety didn’t damage her appeal as a serial heroine one bit. Her heroines were always full of unflagging enthusiasm, and always managed to survive the hazards of the hectic serial world with pluck and energy to spare. Acting talent becomes largely irrelevant where a charmer like Kay Aldridge is concerned. Above: A publicity portrait of Kay Aldridge from Perils of Nyoka (Republic, 1942). Acknowledgements: The biographical information in this piece was derived from Merrill T. McCord’s book Perils of Kay Aldridge: Life of the Serial Queen (Alhambra, 1979).